With award-winning PlayTape, instantly create roads for toy vehicle play anytime, anywhere! Just unroll, stick, and drive! PlayTape sticks to any flat surface and is easy to tear and reposition. The recyclable tape peels up without any residue, so cleaning up is a snap. PlayTape is compatible with and made to-scale for popular toy vehicles so you can use it with the toys you already have! With a single roll of PlayTape, create a road or a whole city, places real or imaginary. The possibilities are as endless as a desert highway. PlayTape is a Toy Industry Association 2016 Toy of the Year Finalist and winner of 25 industry awards. 100% Made in the USA. Ages 3+. PlayTape is child safety tested to the highest U.S. and international standards and is ASTM F963, EN-71, ISO 8124, and CPSIA safety compliant. Everyone loves tape. Now you can safely play with it. Need tape roads? PlayTape is the fastest way to create roads for imaginative play, display, or decoration. 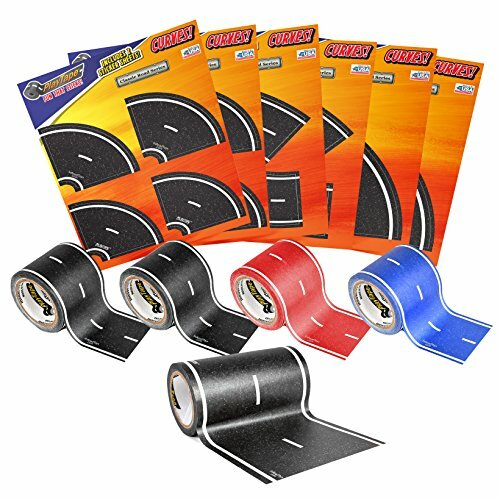 PLENTY OF PLAYTAPE FOR 5 - 7 KIDS - Road and Curve Assortment has everything kids need to create their own world of roads, highways, and racetracks! This jam-packed combo set includes: 2 Rolls Classic Black Road (30' X 2"), 1 Roll of Blue Road (30' X 2"), 1 Roll of Red Road (30' X 2"), 2 Packs each of 2" Black Tight Curves, and 2" Black Broad Curves, 1 Roll of 4" Black Road (30' x 4"), and 2 packs of 4" curves. That's 150 feet of road, and 28 curves in all! SIMPLE TO USE - Just unroll PlayTape, stick to any flat surface, and drive! PlayTape is easy to tear by hand and reposition. And PlayTape is small enough to go anywhere -- perfect for travel. SAFE FOR YOUR CHILD AND YOUR HOME - PlayTape is paper-based, so no sharp scissors or knives are required. Plus, it's safe for your floors, walls, and furniture, peeling up easily with no residue. PlayTape meets all applicable child safety standards and is toxin-free and recyclable. AWARD-WINNING TOY -- A 2016 Toy of the Year Finalist, PlayTape has won over 25 industry awards, including Parent's Magazine Best Toys of 2014, Academics' Choice Brain Toy Award, and Dr Toy's Best Picks of 2015. If you have any questions about this product by InRoad Toys, contact us by completing and submitting the form below. If you are looking for a specif part number, please include it with your message.